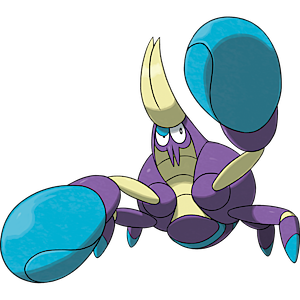 Crabrawler in game: 722 Who? Important notice! Pokemon Crabrawler is a fictional character of humans. Crabrawler (Japanese: ????? Makenkani) is a Fighting-type Pokémon introduced in Generation VII. Crabrawler is a crustacean Pokémon resembling a crab. Most of its shell is purple with blue and yellow accents. It has two long, yellow antennae over its eyes. One blue eyelid is usually half-closed, giving it the appearance of a black eye. The purple shell covering its body appears to be made of three parts: two plain plates covering the shoulders and part of the chest and one plate covered in blue stripes across its underside. A large portion of its yellow body is visible down the center of its chest and a tiny spot is visible in the center of its back. Crabrawler has three pairs of legs. The two rear pairs are smaller with yellow joints and blue tips. The foremost pair of legs has large blue pincers resembling boxing gloves. A Crawbrawler made its anime debut in SM010, under the ownership of Hala. Crabrawler appears to be based on a coconut crab. Makenkani may be a combination of ???? makenki (hates to lose), ?? kenka (fight), and ? kani (crab).